Swedish carmaker Volvo just grabbed headlines by announcing that starting in 2019 all its cars will have electric engines. France is the latest country to announce it will ban gas and diesel cars within a couple of decades. Move over, gas guzzlers! The plug-in cars are here. Volvo and France woke me up to a quiet revolution that has happened in the decade or so since "electric car" meant Tesla, and "hybrid" meant Prius. Now every car maker offers at least one electric car, often several, some at half the price of a Tesla, although that's still not cheap. I've been passing these little cars on the road daily without realizing they're electric vehicles (EVs) , such as the pert turquoise Nissan Leaf and boxy Kia Soul that sat beside me at a traffic light yesterday. BMW has an e-car too, and so do Hyundai and Volkswagon. Chevrolet offers two EVs, the Chevy Volt with a 100-kilometre range, and the Chevy Bolt, which boasts a range of 238 miles, or about 440 kilometres. The BCAA lists 23 kinds of hybrid or electric vehicles available in Canada. Limited range doesn't matter, argue EV advocates, because most car trips are short. At least 80 per cent and up to 95 per cent of all single-use car trips travel only 80 to 95 kilometres. One survey of more than 100,000 commuters found that 95 per cent drove less than 40 miles (64 kilometres) to work, with the average being 13.8 miles (22 kilometres). The key to driving an EV seems to be frequent re-fueling. An EV works best if you can have a plug-in at home and at work, and perhaps on local shopping streets or in parkades. Part of the trade-off is that -- since they're powered by batteries and not by internal combustion engines with all their moving pistons and crankshafts -- EVs rarely need repairs. In addition to EVs, there are hybrids, for longer commutes. Even more car makers offer hybrids, from Smart cars to Priuses to Mitsubishis. Hybrids use gas engines to get them started and keep them going should the battery run down, but rely on electricity to power most of the drive. Worry about climate change drives this changeover. "Collectively, cars and trucks account for nearly one-fifth of all U.S. emissions," says the Union of Concerned Scientists, "emitting around 24 pounds of carbon dioxide and other global-warming gases for every gallon of gas. About five pounds comes from the extraction, production, and delivery of the fuel, while the great bulk of heat-trapping emissions -- more than 19 pounds per gallon -- comes right out of a car's tailpipe." Altogether, says the UCS, "the U.S. transportation sector -- which includes cars, trucks, planes, trains, ships, and freight -- produces nearly 30 per cent of all US global warming emissions, more than almost any other sector." The Paris climate change agreement sets 2018 as a halfway point, for parties to review and report progress towards their own nationally determined goals. Governments will have to tackle transportation emissions somehow, and promoting e-car sales is a heck of a lot faster than trying to build enough public transit infrastructure to replace cars by 2020. "Only Sweden, France, and Germany are pursuing climate goals, says study," reported The Guardian in March. This time, the marketplace may help. Half of all new cars in Norway are hybrid or electric. The Netherlands, Germany and Japan have recorded soaring EV and hybrid sales. France will ban sales of new gas and diesel cars by 2040. Some governments are offering incentives for companies to make all their commercial vehicles electric, from taxis to trucks. "Rhode Island and seven other U.S. states that follow California's zero-emissions vehicle (ZEV) mandate (California, Connecticut, Maryland, Massachusetts, New York, Oregon, and Vermont), along with a global ZEV alliance that includes Germany, the United Kingdom, the Netherlands, Norway, and Canada (limited to Quebec), say they'll allow automakers to sell only those vehicles by 2050," writes Clifford Atiyeh for Car & Driver. "This will be one of the deepest, fastest and most profound disruptions of transportation in history," write Tony Seba and James Arbib in North American Energy News. "If automakers don't react fast, they risk going out of business -- playing catch-up is extremely difficult." The U.S. Energy Information Administration reported in June that there were a total of 2,000,000 EVs on the road worldwide in 2016 -- which was double the number there had been the year before. EV s seem most popular in warm climates, like Florida. "In cold weather, all cars get less efficient," says the Union of Concerned Scientists. But where gas-driven cars consume more fuel and use the waste heat to warm the passenger cabin, electric cars lose some of their range. Some folks worry that EV batteries are themselves are so toxic that disposal cancels out their apparent environmental friendliness. Blogger Jeremy Laue researched this idea and discovered that modern batteries cause some environmental damage during the manufacturing process but are not a worry during disposal. Disposal is easy. "The nickel-metal hydride batteries are 'zero landfill' products, which means that, once the nickle, copper, and rare metals are extracted, the rest of the battery is destroyed. There is literally nothing left to send to the landfill." The real issue, Laue found, is how the electricity is generated. "It's important to remember that 45 per cent of electricity in the United States is generated by coal power plants. This study from the Argonne National Laboratory shows that if a plug-in hybrid charges on an energy grid that uses mostly coal to generate electricity it would be responsible for emitting up to 10 per cent more greenhouse gases than a conventional gas powered car, and up to 60 per cent more than a standard hybrid." 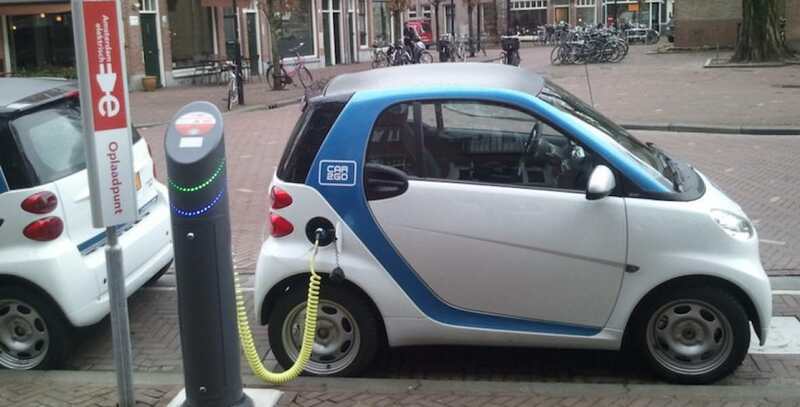 So we all may be plugging in our cars sooner than we expect. Or not. Car ownership may seem archaic eventually. We may all rely on hiring self-driving electric cars that take us where we want to go. "A $20 Uber or Lyft fare could be slashed to $2," suggests a recent USA Today article. "Better yet, it might even be free if the ride provider is, say, a Starbucks autonomous ride-sharing van that's covering the cost of your 40-cent commute by selling you a pricey latte." Self-driving, latte-delivering, shared ride EVs, available at the press of a phone app? Well, that day is possible, way in the future. But ready or not, e-cars are here now. We still need better batteries to give a longer distance between charges, before I get interested. Another problem area is how to stop vandalism of public charging points, and there are not enough of them. Think diesel is on the way out, due to the complexity of burn cycle and the introduction of adblue, that why I went back to a petrol engined Fortwo, which only has a for life catalyst and a few O2 sensors to worry about.